The amount of personal information people store on smartphones, make mobile handsets a prime target for hackers. Not only are you susceptible to identity theft, but now that mobile technology is moving into the realms of online banking, auto-pay accounts and digital wallets, hackers can use malware to access your money. Mobile phones infected with malware are pretty easy to detect. If you have ever had a virus on your laptop or desktop computer you will recognise irrational behaviour. It is the same with your phone. It will send random messages, open apps by itself, and the battery drains quicker than usual. You may also detect unfamiliar charges on your phone bill. Curing malware attacks is easily resolved by downloading Lookout Antivirus from Google Play. It´s free of charge. If you own an iPhone use Trend Micro Mobile. But by the time you have fixed the malware threat, you may have already lost personal information and money that you cannot recover. 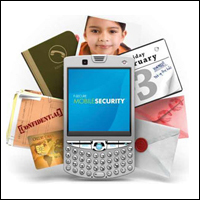 Therefore you need to take preventative measures to ensure mobile security. How can I protect my mobile against malware? Malware writers target weak links in the operating systems of mobile devices. You can minimise the risk of being infected by regularly downloading new software whenever it is released by the parent company that created the OS (i.e Android, Apple, Microsoft). You also need a strong password which should be updated periodically too. A strong password should contain letters and digits. The problem is, constantly changing passwords is difficult to remember, therefore you need a system to make this easier. Choose a word that is familiar to you, but spell it using numbers in the place of letters wherever possible. To give you an example, the password Pink Elephant would look like this: p1nk313phant. Easy to remember and quite fun! If you get a message that is unusual research it on Google to see if anybody else has had the same experience. Likewise, before you purchase an app, verify its authenticity by conducting a quick Google check. It´s best practice only to download apps from trusted sources. Similar care should be taken when web browsing. Use a tool like LookOut Premium to notify you when a link you click on is potentially damaging. Knowing how hackers can use your information makes you think twice about how you use your phone and share information. For example, a free public WiFi service is unsecured and allows hackers access to your online data, therefore never check your online bank account in an unsecured zone. Also avoid sharing banking information using text messages or IM chat forums. If it is vitally necessary you have to do this, delete the message immediately. Likewise, whenever you get a message from your bank. If you have used your smartphone for online banking and your handset is stolen, alert your bank immediately so they can stop electronic transfers going out of your account. It goes without saying that you should protect your smartphone against malware with an antivirus program such as BullGuard or McAfee But even with antivirus software, you should still take preventative measures to protect your mobile from malware attacks. Have you ever experienced a malware on your mobile or had your account compromised? Tell us in the comments below. Going mobile in 2013? Get in touch with our mobile app developers to learn more about mobile sites and apps.